Yesterday we talked about the how Goombas stepped it up a notch with their ultimate weapon (the shoe) but when you think about it that pails in comparison to today’s entry. 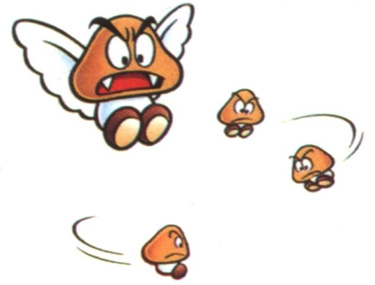 Para-Goombas are Goombas that hate you so much that they grew wings. That’s horrifying. Really. Thankfully you can still stop them to death but the first time only takes their wings away. Of course the red ones can’t really fly. They just hop around spastically. Speaking of spastic jumping, the regular color Para- Goombas have a secret. They’re moms! While flying overhead they drop parasitic Micro-Goombas on you. Micro-Goombas cut your jump height down to inches. Once they’re on, all you can do is hop around like a mad man till they finally pop off. All the while the mother is swooping down to finish you off.